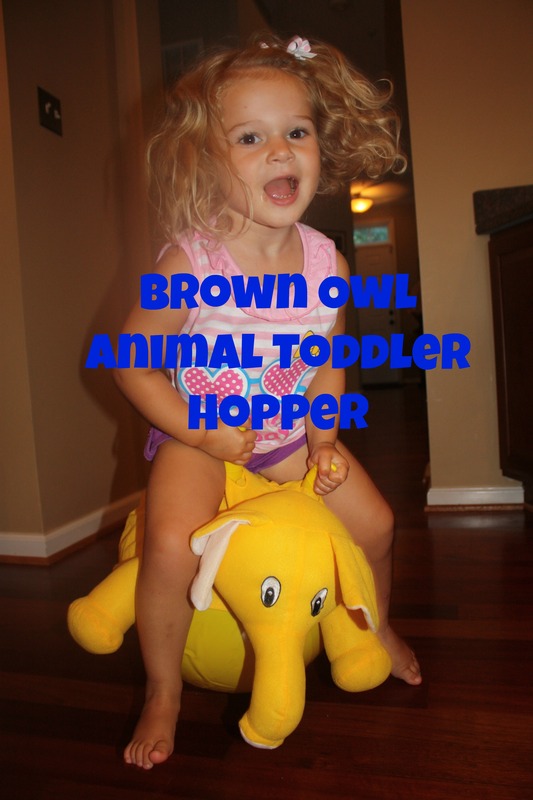 This is Three and a Brown Owl Animal Hopper Giveaway! There is a laundry list of things I get wrong when it comes to parenting: veggies at dinner…sometimes, too much iPad time, and always eating my kids’ dessert when they aren’t looking. But there is one thing I always do right, and that, friends, are birthdays. Birthdays in this house are a big deal. A BIG, BIG, BIG deal. I’m a firm believer that if your Mamma doesn’t make a huge fuss over your birthday, then who will? Now I’m not talking about some crazy party that the final bill could rival a wedding, but a day that is filled with so much joy that the birthday baby is just ready to burst with fun, love, cake, and pure birthday bliss. 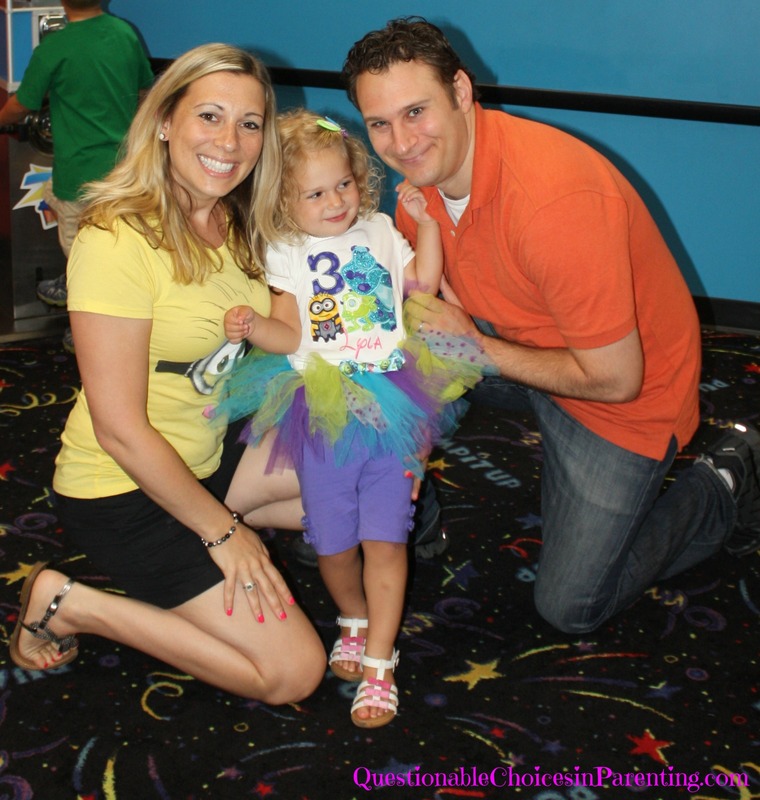 It’s cupcakes for breakfast, being sung the birthday song at least 25 times, and blowing out candles on a really fabulous cakes while wearing a special birthday outfit, and a party that screams “It’s My Birthday and It’s All About How Awesome I Am!” After all, this fabulous girl is three! 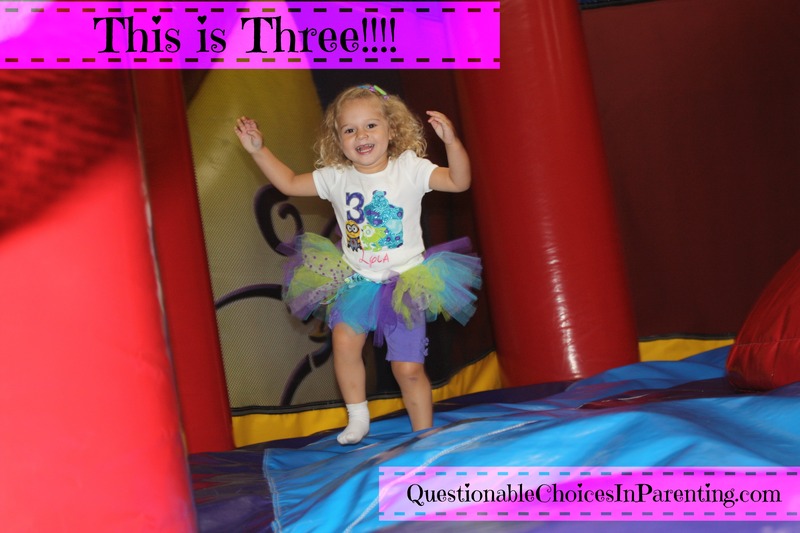 When my gal was nearing the end of her terrible twos, twos and we were looking ahead to three, it was time to start planning. One thing that I love about my fun, fearless, and fierce Little Mamma is that she loves what she loves. While she can sing every song in Frozen (just ask her and she’ll do it), her first loves are Mike and Sulley from Monster’s Inc and the Minions from Despicable Me. Three is a big birthday, so there’s no need to pick just one–so we went with all three of her favorite characters as the inspiration. And what would a party be without a cake? When we have birthday cakes, we go for fabulous and delicious from the amazing Whitnee at Cake to Crumbs Bakery. 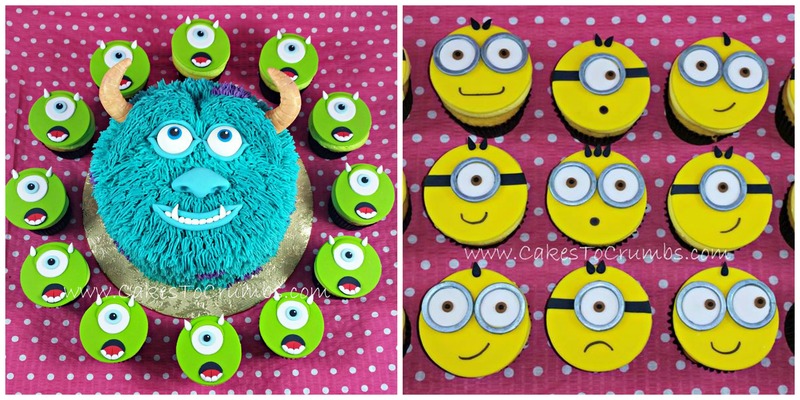 She creates extraordinary and super yummy cakes every year for my kids. We didn’t have a single cupcake or piece of cake left–bummer, right? But that just shows how delicious her cakes are, and seriously, can you stand how adorable! Usually the birthday girl gets an icing flower on her piece of cake, but my gal requested Sulley’s eye–gross but fitting. Early on in our birthday party circuit, I learned that party favors can be a bit of a waste and simply annoy the parents of the party guests. So this year I went for simple and found these adorable Sulley hats. 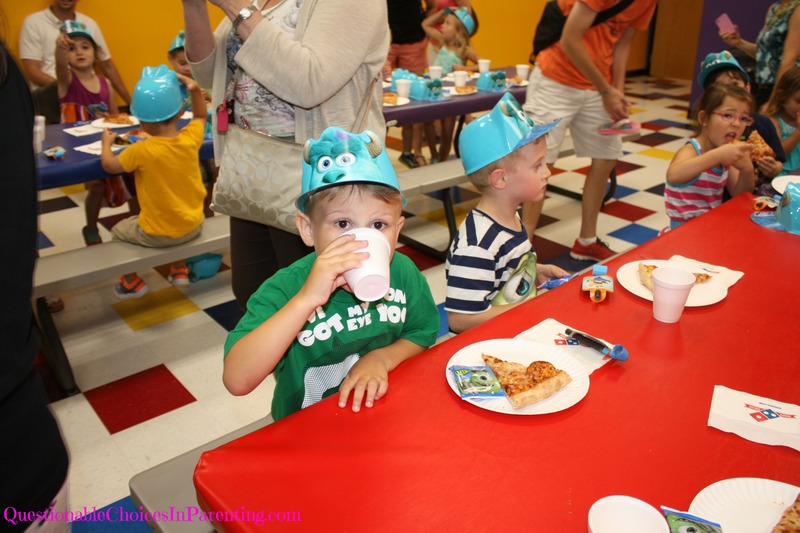 I wasn’t sure if the kids would even like them, but couldn’t stop laughing when I saw all of the party goers eating their pizza and wearing these adorable hats. Here is my main man who worked up a sweat jumping and needed a little apple juice. 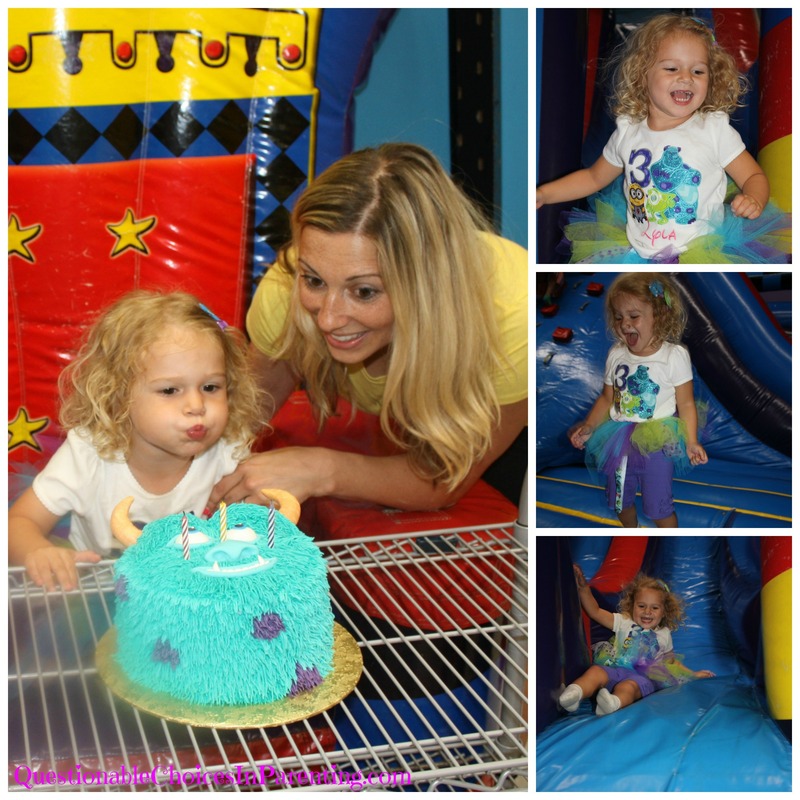 The best part of this birthday party was my birthday girl’s face the entire day. Pure Joy! She bounced her little heart out, blew out her candles on the first try, and crashed the minute she hit the car on the way home. Always a good sign of a great birthday party. 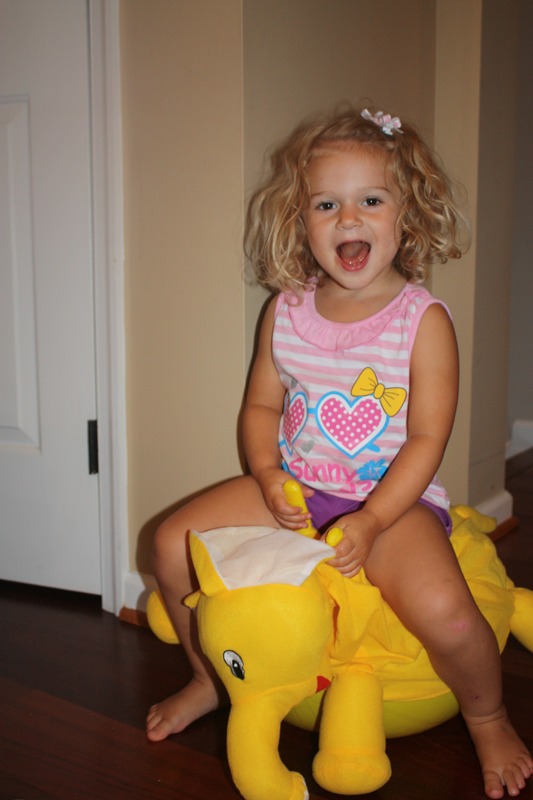 Since my gal loves to jump and bounce, she was thrilled when the nice people of Brown Owl sent her the Elephant Animal Hopper to bounce her little heart out and in celebration of my gal’s birthday, they are giving away an Animal Hopper to one of my readers! As soon as we handed her “Rocky” the elephant, she was off and bouncing. She even started singing a little song all about “Rocky.” The toy was really easy to inflate and watching this crazy lady play proves it’s durable. Added bonus, she can even play with “Rocky” outside, and since the cover is removable and washable, we don’t have to worry that “Rocky” looks dirty and gross. What a perfect gift for a kiddo on the move! Find Brown Owl Toys on Facebook too! You can win one too! Enter here for your chance to win. The contest ends 8/10/14. Good luck!